I modeled this recipe loosely after a casserole dish my Mom made often when I was starting out as an 11 year old vegetarian (not yet vegan). If I can remember, the original casserole used Campbell's canned cream of mushroom soup, and cheese covered the top. I'm pretty sure there was no pasta, just broccoli. I added tofu cubes to mimic chicken and added spaghetti pasta which makes it a real meal. Want to know what others thought about this recipe? Would you like to comment on this recipe? Go to the Broccoli Curry Casserole blog entry. 1/2 14 oz. Block of Extra Firm Tofu, Previously Frozen, Thawed. In my opinion, you should freeze tofu for a minimum of 2 weeks. This is enough time for the ice crystals to perform their texture altering magic. You can leave the tofu in the freezer for up to 3 months before you have to toss it out. If you leave it in longer than 3 months it becomes dried out. You can quickly thaw out the tofu by sticking it in the microwave on a plate and zapping it for 10 minutes. If you have an aversion to microwaves you will have to let it sit out and let it thaw naturally, which will take a lot longer. Take the thawed extra firm tofu, press the water out by placing it between two heavy plates. Just press the water out over the sink and be gentle, we want to keep it whole. After you've pressed the water out cut it into 1 inch cubes. Then sprinkle it with the lemon pepper and poultry seasoning and massage it into the tofu. Cook spaghetti noodles according to directions on the package. 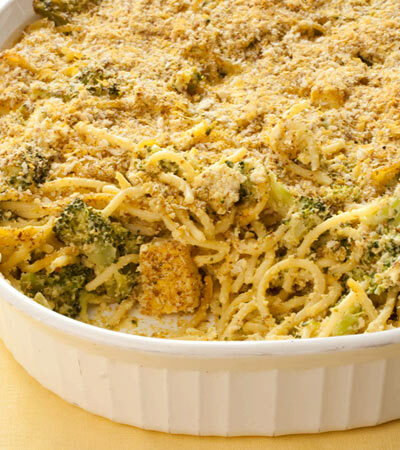 While the pasta is cooking, place the broccoli into a medium sized sauce pan with the water and cook covered for about 3 to 4 minutes on high heat. Next, make the cream. In a food processor place almonds and salt and process for 1 minute. Then put the rest of the ingredients in and process for another 2 minutes. Pour this in with the cooked and drained spaghetti noodles and stir together. Then put the broccoli and tofu chunks and stir together. Prepare a 12" X 9" casserole dish that is at least 1 & 1/2 inch deep by greasing the inside with the teaspoon of oil. 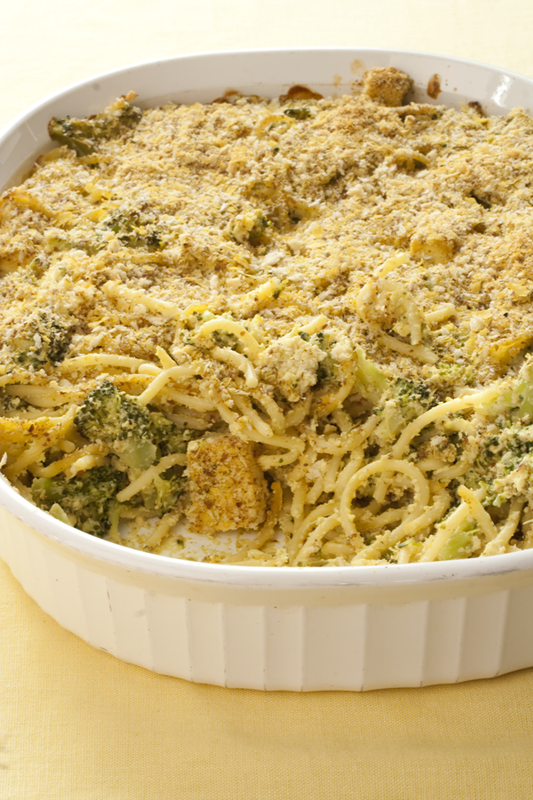 Pour the broccoli, spaghetti and "chicken" cubes you mixed up into the casserole dish and spread evenly. In a small mixing bowl mix together the flax seed, yeast flakes and cracker crumbs and spread evenly on the top. It's important to cover the top completely, making sure no noodles are poking through the topping. Any pasta not covered will become over cooked while baking. The topping helps keep the pasta protected while it bakes.